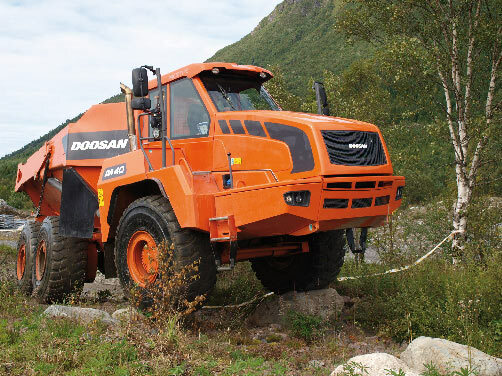 Doosan company has introduced new articulated trucks DA30 and DA40. The new articulated dump trucks (ADT) have a payload of 28 and 40 metric tonne, respectively, offer many new features to meet customer demands. The DA30 is driven by the 5-cylinder Scania DC9 Stage IIIB compliant diesel engine with a gross power output of 276 kW (375 HP), which offers an 8% increase in engine power compared to the predecessor MT31. The DA40 is powered by the 6-cylinder Scania DC13 Stage IIIB compliant diesel engine with a gross power output of 368 kW (500 HP) at 2100 rpm, which offers a 10% increase in engine power compared to the previous MT41 model. In combination with the greater engine power, the DA30 and DA40 also have 30% more gross torque. The increased engine power is combined with SCR technology for ‘best-in-class’ fuel consumption with a higher top speed of 58 km/h (34 mph). Contributing to the overall 8% reduction in fuel consumption (under standard working conditions) is the new ZF transmission offering 8 forward and 4 reverse speeds. As well as permanent 6-wheel drive, the DA30 and DA40 also have a free-swinging rear tandem bogie designed to ensure that all 6 wheels are in continuous contact with the ground, enabling the truck to operate on very rough and soft terrain. 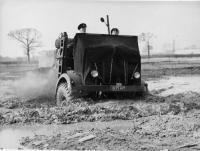 The sloping rear frame enhances the stability of the truck thanks to its low centre of gravity and allows fast and easy tipping, even in the most demanding conditions. The new models have a new cab providing more space and improved visibility for the operator, ‘best in class’ noise levels and a fully automatic climate control system. For easier operation, Doosan has introduced new electronic systems and simplified fingertip controls with a digital display of all desired machine functions.